Does your little canine buddy love to travel? 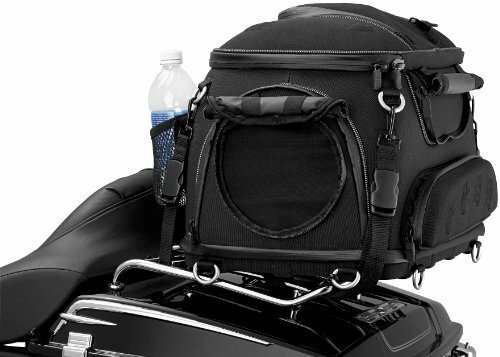 Are you looking for an amazing selection of Motorcycle Dog Carriers? 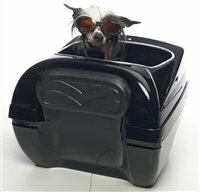 I would like to share with you some of the best pet carriers for motorcycles. We have a small dog that we take with us on our motorcycle rides. She loves being with us, and it is important to us that she be able to travel in safety and comfort. This is a picture of our sweet little Bella in her motorcycle small dog carrier. There are several safety features that are required in motorcycle carriers for dogs. Just like real children, our fur babies need to be safe! A ring on the inside of the motorcycle pet carrier allows you to clip a small tether to their harness. This prevents them from accidentally jumping out at an inopportune time. Check to ensure the pooch has enough leash room to lie down or stand up, but not so much that they will get tangled or be able to jump out the top totally. Closable mesh vents are a must have. Having the ability to zip your dog inside the travel pet carrier is so important. That way in inclement weather they are snug and dry. Equally important is to be able to have vents on most or all sides for ventilation on those hot days. There must be a way to fasten the motorcycle carriers for dogs securely to your motorcycle. There must be no chance of it coming loose and falling off while motoring down the highway. A comfortable bed on the inside of the travel pet carrier for your furry best friend. A dogs portable palace should be super comfy. Make sure to pack lots of water and a small bag of food and treats along with travel bowls. In the summer time, I always put ice packs under her mat to help keep her cool in the small dog carrier. I have also put ice water in a plastic bottle inside the carrier by a vent so the hot air is cooled as it blows in the motorcycle dog carrier. This is indeed a pet palace. This rigid framed pet carrier for small dogs comes with dishes in a zippered pocket, an adjustable leash, and adjustable straps for attaching the pet carrier to your motorcycle. On the inside is a washable faux fur mat and sturdy rings for attaching the leash to your pets harness or collar. There are zippered compartments for a leash and food and a water bottle holder and there is reflective piping on the water resistant bag for visibility. This leather motorcycle dog carrier measures 21.5 inches by 18 inches by 17 inches. This awesome pet palace attaches on any luggage rack. There are several zippered, vented flaps to allow air circulation to your tail wagging companion. A zippered compartment holds the included dishes. There are two leashes, a short tethering leash and a longer walking leash. Inside this motorcycle pet carrier dogs will love is a sliding leash mount and an easy clean tray and resting pad for comfort. Measurements of this leather beauty are 16 inches by 14 inches by 14 inches. Lots of room for a curve loving side kick. The T-Bags Pet Carrier is made of 1680 Denier Ballistic Nylon. 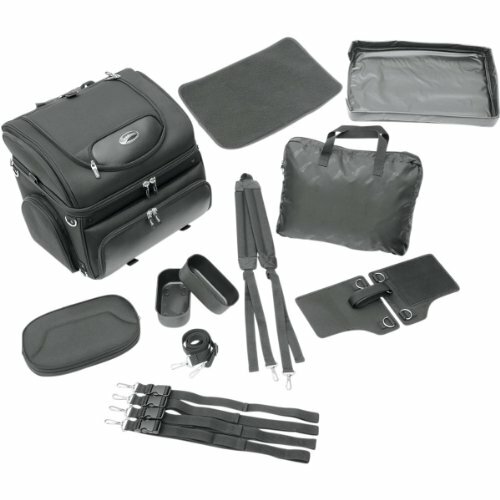 An expandable mounting system ensures a proper fit to all backrests and luggage racks. All vents have zippered weather proof flaps. Your doggie will be comfortable inside the foam filled bottom on top of a sheep skin pad that is easy to remove for washing. Internal D-rings will insure that the included leashes will stay securely in place. One side opens completely for easy loading. 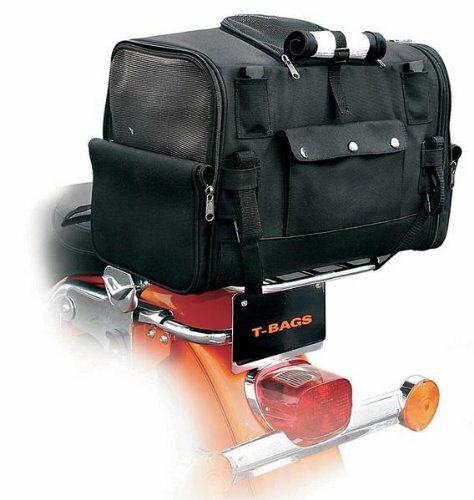 This textile motorcycle pet carrier measures 19 inches by 13.5 inches by 12 inches. 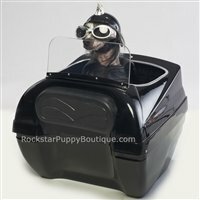 There are two models of this hard shelled fiberglass motorcycle dog carrier. One has windshield, the other does not. All mounting hardware is included to attach this small dog carrier to your luggage rack. This is not a quick release system. This is just a shell. You will have to customize the interior of the bag to make it comfortable and safe for your canine friend. This item measures 15 inches by 16.5inches by 12.5 inches. Thank you for visiting my article on motorcycle dog carriers for your traveling small dog. Whether you ride an import motorcycle or a Harley Davidson, motorcycle pet carriers should be safe and comfortable for both of you. I hope you and your furry buddy have many happy motorcycling trips together.